Now that Intel’s X25-E Extreme SSD is boasting sustained sequential read speeds of up to 250MB/sec, the maximum 300MB/sec throughput of SATA II is starting to look dangerously close to saturation-point. However, it looks as though the move to the next-generation 6Gb/sec SATA 3.0 interface is now in full force, as Seagate and AMD are reportedly going to demonstrate a 6Gb/sec SATA setup in New Orleans today. He added that "six-gig is a perfect interface. 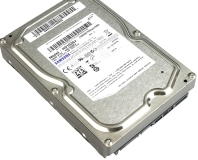 OEMs tell us that they want to have the same SATA interface for flash as for a 1.8in rotating drive, so they can swap in a drive for flash, or vice versa." Noblitt told the site that the new 6Gb/sec SATA interface would feature improved streaming characteristics that aren’t currently found in 3Gb/sec SATA drives with native command queuing. The site also says that executives from the companies say that the new technology will be primarily target at gaming PCs and servers. Originally announced by the SATA-IO organisation in August last year, the new 6Gb/sec SATA interface promises to maintain backward compatibility with earlier SATA implementations. The SATA-IO group says that “the same cables and connectors used for current SATA implementations can be used to connect SATA 6Gb/sec devices, although SATA-IO recommends utilising quality components to ensure data integrity and robust operation at the fast 6Gb/sec transfer rate." Do we need a 6Gb/sec SATA interface yet? Let us know your thoughts in the forums. 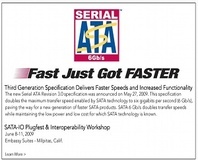 The Serial ATA International Organisation has put the finishing touches to revision 3.0 of the SATA specification - and looks set to offer 6Gb/s throughput. SSDs might be able to deliver blistering read speeds, but they tend to fall down when it comes to write. Not so the Intel X25-E, which claims both blistering fast read and write speeds thanks to the use of SLC NAND flash memory. We find out if Intel's Extreme series SSD can make the grade and justify its monster price tag.